At Family Ayala’s Upholstery, we believe that your home should be your favorite place. Having clean and gorgeous furniture helps people gather in your home, make them feel comfortable and welcome. Good furniture helps keep your home your favorite place. We provide you with unmatched customer service and trustworthy expertise. When you bring your furniture to us, in any state or condition, you receive the “Ayala family touch.” Ayala Upholstery Shop has been owned & operated by the same family for over 43 years, and we’ve been proud to serve the San Fernando Valley for all of these years. Without you, we could not continue to do what we love doing. Re-upholstering, re-creating and refinishing, and making furniture that works for you – your home and your lifestyle – is what we passionately love to do. 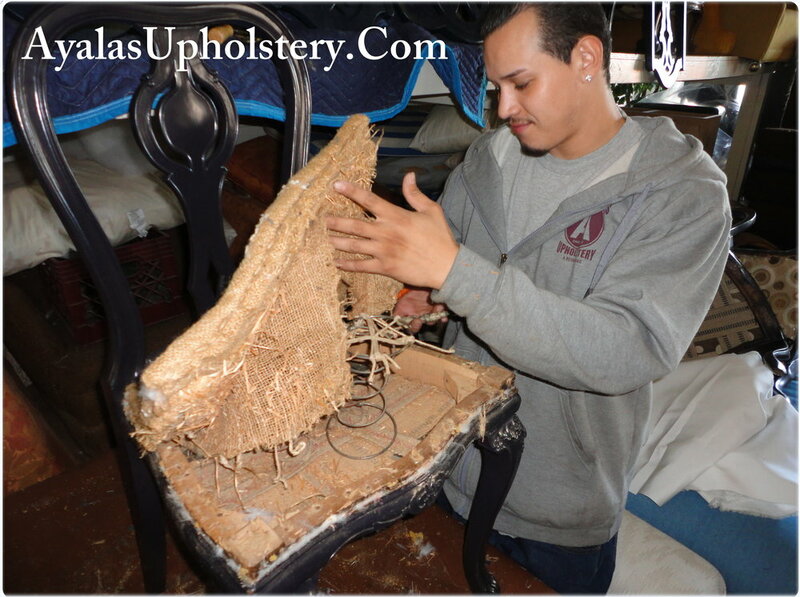 Ayala Upholstery thanks you for your encouragement, your support and customer loyalty. We hope you always feel free to ask any questions for any project that you may have on your mind – big or small. We will be more than happy to be of any assistance. Is your furniture falling apart? Are your chairs no longer soft? Is your sofa sinking in the middle? It is definitely time to reupholster your old furniture to your new and stylish personality. This will take your current home from somewhere that feels run down to a modern and inviting environment that you deserve. Why? Because your home should feel like home: a welcoming and inviting place. Sometimes your home is a place to gather with people you love. Home can be your quiet place for contemplative thoughts and moments. For some people, home is a place to catch up on work from time to time. Frequently, your home is a retreat from our busy world. We specialize in your unique furniture repair needs. From repairing and adding new upholstery to your antique Bergère chairs that are handed down from your grandmother, to assisting you with your inspirational redesigns, we demonstrate that redesigned and high-end custom furniture can be affordable and long lasting. With over several decades of family experience, we can not only repair your furniture, but create something new and upgraded with our inspiration redesigns. Couches, sectionals and chairs, tables and benches, stunning headboards and even new settings for breakfast nooks to gather around your kitchen table are a part of our history we offer to you. We have also created custom (fitted) slipcovers for a variety of different furniture –another great way to change your look. We have expanded tremendously over the years. Ayala Upholstery has something for every room in your home. There’s a lot that goes into furniture repair, and taking top-quality care of your furniture is a priority. When you want something repaired, it should also be restored. 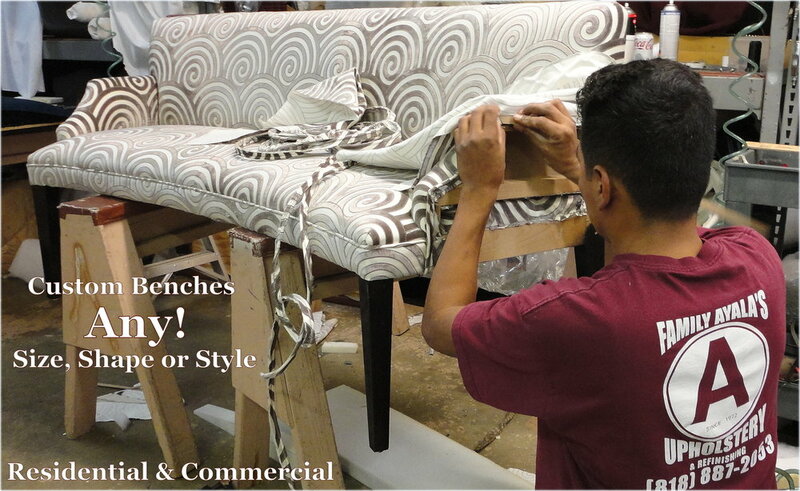 You want durability and comfort, and you will definitely find it at Ayala Upholstery Shop. Here’s a typical work-order: When we replace the Sofa Spring, we reinforce it with hand-tied burlap strip. Everything is re-webbed, tightened, screwed, and glued where necessary to the appropriate areas of the frame. Everything is then properly secured for that perfect feeling. We apply this same standard to all of our work, on all types of furniture. So whether it’s an old family heirloom or a modern piece for the office, your furniture will be safe in our hands.